A larger show of 25 prime cattle were forward, trade was very similar to previous weeks with all buyers in attendance ensuring prices remain competitive with other local centres. Limousin 197.5p Englishtown, 193.5p Houghton House and Plumpe, 191.5p Englishtown. Limousin 206.5p Houghton House, 189.5p Sceughdyke. Angus 189.5p, 182.5p, 177.5p, 164.5p (x3) Low Hallburn. Limousin £1,306 Plumpe, £1,257 Houghton House, £1,234, £1,149 Englishtown. Limousin £1,212 Sceughdyke, £1,135 Houghton House, £1,036 Englishtown. 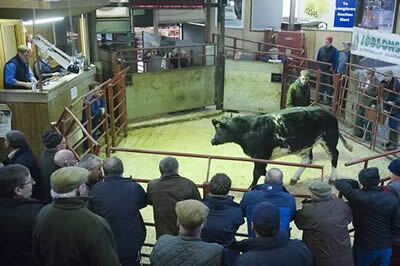 Angus £1,118, £1,082 Low Hallburn, £1,033 Plumpe, £1,031 Low Hallburn, £1,007 Plumpe. A larger show of 299 spring lambs were forward at our annual show and sale. All classes sold better than anticipated but still fell a long ways short of vendors expectations. Sale averaged 180ppk with light weight lambs easier to sell although heavy weights more per head. Top price of £100 per head for Suffolks from Mid Upper Priestside, and to 211p per kilo for Texels from The Wynd and Cottage Farm. The pre-sale show was ably judged by Stephen Stoddart, Hillside, Wigton who awarded the first prize single class to Messrs IT & KF Carruthers, Glenzierfoot scaling at 51kg realizing £96/188ppk and selling to Bowood Farms Ltd. Second prize single lamb was awarded to RG Dodd, Greenbrae weighing 50kg and realising £97/194ppk also selling to Bowood Farms Ltd.
First prize pair of lambs was presented to Messrs IT & KF Carruthers, Glenzierfoot with the lambs weighing 45kg selling at £90/200ppk to Bowood Farms Ltd and second prize pair going to RG Dodd, Greenbrae at 46kg realising £88/191ppk again to Bowood Farms Ltd.
Texel 211p The Wynd and Cottage Farm, 204p Trawhill, 203p Milton Mains, 202p, 200p Glenzierfoot. Suffolk 190p Westend , Fenton and Nirvana, 188p Cottage Farm, 186p Westend, 184p Nirvana. Charolais 195p, 185p Kimmiter Green. Suffolk £100 Mid Upper Priestside, £98 Kimmiter Green, £95 Fenton, £91, £85.50 Westend. Texel £97 Greenbrae and Glenzierfoot, £96 Glenzierfoot and Campingholm, £93 Campingholm, £90 Gelnzierfoot. Charolais £86 Kimmiter Green, £82 Dunnabie House. Cross £72 Airds of Balcary. Another large show of 4,433 prime hoggs were forward to the usual ring of buyers. As experienced throughout the country this week, trade was very hard going. The sale average was 159ppk with SQQ 161ppk. A mixed show of hoggs saw a two tier trade with well fleshed hoggs realising a good steady trade but plainer types were realisation. Heavy hoggs bucked the trend and were easy to sell. Two tooth hoggs easier on the week. Sale topped at £100 for a Charolais from KJ & CS Wilson Ltd, Wood farm and to 196ppk for Texels from J C Dunlop, Blackwater, Kilmacolm. Hill Cheviot 189p Eden Hall, 186p West Logan, 177p Redwood House, 174p Wicketthorn. Texel 196p Blackwater, 194p Balliemore, 190p Broomhills, 189p Blackwater. North Country Cheviot 165p Southend, 163p Eden Hall and Cleughbrae, 162p Southend. Suffolk 168p, 163p Eden Hall, 161p Keith, Braes of Enzie, Southend and Eden Hall. Blackface 172p Sykehead, 167p Macharioch, 162p Southernby Hall, 161p Hayclose and Braes of Enzie. Greyface 169p Sykehead, 168p Golden Lane, 160p Tangy. Charollais 185p Upper Auchenlay, 175p Wood Farm. Jacob 142p Copperthorns, 138p Bidlake. Shetland 163p, 154p Golden Lane. Texel £95 Kilnhill, £ 94 Braes of Enzie, £93 Glendue, £90, £89 Blackwater. Suffolk £87 Keith, £85.50 Southend, £84 Blackwater. North Country Cheviot £80 Cleughbrae, £79 Southend and Redwood House, £76 Southend. Hill Cheviot £89 Wicketthorn, £88 Broomhills, £80 Wicketthorn, £79 Redwood House. Greyface £80 Barnakill, £76 Glenhervie and Machaioch, £75 Blackwater and Broomhills, £74 Keith. Blackface £83 Maxwell St, £75.50 Braes of Enzie, £72 Broomhills£70 Macharioch. Beltex £70 Balliemore, £67 Sowerby Wood. 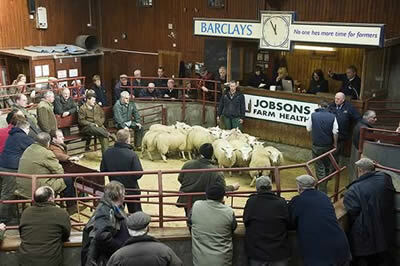 A larger show of 3,467 cast ewes and rams were forward to the usual ring of buyers. Trade for all classes would be £6-10 easier on the week with the fat ewes suffering the most. Smaller hill type ewes looked dear in comparison and tups maintained recent high rates. Texel £154 Heatherglen, £148 Rascarrel, £142 Moss Cottage, £140 West Logan. Suffolk £123 Viewley, £121 Beckfoot, £120 New Farm and Viewley, £118 Catslackburn. Charollais £147 Riggheads, £138 Heatherglen, £137 Chaseside, £132 Beckfoot, £129 Viewley. Leicester £108 Randalholme, £100 Maxwell St, £90 Weeds, £88 Arnicle. Beltex £110 The Wreay, £108 Copperthorns, £91 Balliemore. North Country Cheviot £115 Chirdon, £102 Beckfoot, £100 Haithwaite, £93 Adderston Shiels. Bleu d’Maine £104 Pasture House. Greyface £99 Drumhumphry, £94 Glendue, £88 Kirkhouse and D’Mainholm. Zwartbles £96, £92 Heatherglen, £92 Chaseside. Cheviot Mule £90 Heatherglen, Golden Lane and Haithwaite, £89 Killean Estate. Dorset £91 Cannon Park, £88 Mossband Hall. £86 Haithwaite. Hill Cheviot £84 Kirkhouse, £83 Blackburn, £79 Bush of Ewes. Blackface £83 Drumhumphry, £78 Penpeugh, £76 Marygate, £75 Chirdon and Wanwood Hill. Lleyn £88 Priestdykes, £74 Pasture House, £72 Bidlake. Swaledale £80 Coombe Crag, £75 Hepplehill, £73 Highside, £70 Denton Mains. Easycare £80 Peddar Hill, £64 Pasture House. Texel £174 Glendue, £170 Beckfoot, £159 Chaseside, £151 Coombe Keal, £150 Keld Head. Leicester £161 Kirkhouse, £160 Broomhouse, £140 Kirkhouse, £136 Cara View. Suffolk £164 Viewley, £148, £128 Beckfoot, £123 Hunderlee, £120 Viewley. Charollais £160 Hunderlee, £158 Broomhouse, £150 Chaseside and Bidlake, £142 Heatherglen. North Country Cheviot £95 Heatherglen. Dorset £148 Heatherglen, £104 Chaseside. Blackface £119 Viewley, £114 Drumhumphry, £101 Kersknowe, £98 Kirkhouse.